Add some Comic Superhero flair to your room. This unique print of hand drawn halftone DC Comics art shows your favorite superhero on an eye-catching metallic background. Makes an impressive gift for the Comics and superhero fans in your life. This sophisticated Flash illustration printed on large 25 inch x 25 inch metallic canvas would look incredible in a man cave, bedroom, playroom or any other superhero 'lair'. Forget those ordinary cheap superhero posters that everyone has. Stand out from the rest and be your own superhero with this beautiful The Flash art mounted on an MDF Wood stretcher. Why fumble around with posters that need to be framed, when this art comes stretched and ready to hang! This iconic comic figure could be hanging on your wall 5 minutes after you receive it. Add some retro Comic flair to your room. This unique print of hand drawn halftone DC Comics Canvas Wall art shows your favorite Hero on an eye-catching metallic background. Makes an impressive gift for the Comics and superhero fans in your life. 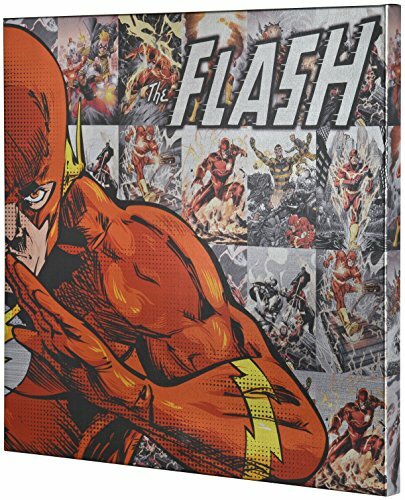 This sophisticated Flash illustration printed on large 25 inch by 25 inch by 1.5 inched deep brilliant metallic canvas would look incredible in a man cave, bedroom, playroom or any other geek 'lair'. Forget those ordinary cheap superhero posters that everyone has. Stand out from the rest and be your own superhero with this beautiful Harley Quinn art mounted on an MDF stretcher. Why fumble around with posters that need to be framed when this art comes stretched and ready to hang! This iconic comic figure could be hanging on your wall 5 minutes after you receive it. If you have any questions about this product by Edge home, contact us by completing and submitting the form below. If you are looking for a specif part number, please include it with your message.